The extent of the loss which the country sustains every year from injury to woodlands by fire is enormous. An attempt was made to obtain, by means of circulars of inquiry addressed to enumerators of the census and other persons living in every town of the United States, some estimate of the actual destruction of forest material in this way. More than 30,000 of these circulars were sent out. The information obtained, often vague and unsatisfactory, after a most critical examination, in which all doubtful or contradictory returns were entirely thrown out, is presented in the following table and accompanying map. [Results for the United States are presented here, not those for the individual states and territories.] It must be borne in mind that estimates based upon information obtained in this manner are liable to very considerable error, and due allowance must therefore be made for inaccurate or incomplete returns. Many towns, and even counties, in which forest fires are known to have occurred during the year 1880, made no returns whatever, and the returns of other counties were excluded. It is therefore fair, perhaps, to assume that the following table, inaccurate and unsatisfactory as it no doubt is in many respects, at least does not exaggerate the annual loss inflicted upon the country by forest fires. The largest number of these fires of any one class was traced to farmers clearing land and allowing their brush fires to escape in the forest. The carelessness of hunters in leaving fires to burn in abandoned camps, next to farmers, was the cause of the greatest injury. The railroads were responsible, too, for serious damage to the forest from fires set by sparks from locomotives, while the intentional burning of herbage in the forest to improve pasturage often caused serious destruction of timber. Only the value of the material actually destroyed by fire is included in these estimates. The loss of timber by fire, great as it is, is insignificant in comparison with the damage inflicted upon the soil itself, or with the influence of fire upon subsequent forest growth. If a forest is destroyed by fire all trees, old and young, giants ready for the ax, and germinating seedlingsthe embryo forests of succeeding centuriesare swept away. Undergrowth essential to protect the early growth of trees, the roots of perennial herbage, and the seeds of all plants are consumed. The fertility, or rather the ability of the burned soil to produce again spontaneously a similar crop of trees to the one destroyed, is lost, and the subsequent recovering of burned land with the species of the original forest is only accomplished, if accomplished at all, through the restoration of fertility following the slow growth and decay of many generations of less valuable plants. A northern pine and spruce forest when destroyed by fire is succeeded by a growth of brambles, in time replaced by dwarf birch, poplar, and bird cherries, of no economic value; scrub oaks and various hard woods follow these, and pine rarely reappears except upon land long mellowed in the various operations of agriculture. In the south Atlantic region a gradual change in the composition of the pine forests in steadily going on under the influence of fire. Less valuable species now occupy the ground once covered with forests of the long-leaved pine, through which annual fires have been allowed to run to improve the scanty pasturage they afford. Stockmen have been benefited at the expense of the permanency of the forest. Fire, too, changes the composition of the broad-leaved forests of the Atlantic region, although its influence is here less marked than upon forests of conifers, which, unlike deciduous trees, rarely grow from stump shoots, and must depend entirely upon the germination of seeds for their reproduction. Still, in regions continually burned over during a long period of time and then covered again with forests, as is the case in some portions of Kentucky and Tennessee, valuable species, like the white oak and the yellow poplar, are rare or entirely wanting in the new forest growth. The forests of the north Pacific coast offer an exception to the law, otherwise general, for this continent at least, that a change of forest crop follows a forest fire. The fir forests of western Washington territory and Oregon when destroyed by fire are quickly replaced by a vigorous growth of the same species, and the fires which have consumed great bodies of the California redwood have not prevented the reproduction of this species by seeds and shoots. In the interior Pacific region forests destroyed by fire either do not reproduce themselves, or when, under exceptionally favorable climatic conditions, a growth of trees recovers the burned surface, poplars and scrub pines replace the more valuable species of the original forest. The damage inflicted upon the permanency of the forests of the country by browsing animals is only surpassed by the injury which they receive from fire. The custom of turning domestic animals into the forest to pick up a scanty and precarious living, common in all parts of the country, is universal in the southern and central portions of the Atlantic region and in California. Sheep, cattle, and horses devour immense quantities of seedling trees, the future forests of the country. They bark the trunks and destroy the vigor and often the life of larger trees. Hogs root up young pines and other plants to feed upon their succulent roots, and devour the edible fruit of many trees. In this way not only is the permanence of the forest endangered, but in the case of deciduous forests their composition is often seriously affected. Species with thin-shelled edible seeds, pines, white oaks, chestnuts, and beeches, are unable to hold their own against species with bitter or unpalatable fruit, on account of the excessive destruction of their seeds by hogs and other animals. In the central portions of the Atlantic region the general replacement of the sweet-fruited valuable white oaks in the young forest growth by the less valuable bitter-fruited black oaks is noticeable, and seriously endangers the future value of the forests of this whole region. The damage inflicted upon the California mountain forests by sheep is immense; they threaten the complete extermination of these noble forests, and with them the entire agricultural resources of the state. The pasturage of the forest is not only enormously expensive in the destruction of young plants and seeds, but this habit induces the burning over every year of great tracts of woodland, which would otherwise be permitted to grow up naturally, in order to hasten the early growth of spring herbage. Such fires, especially in the open pine forests of the south, do not necessarily consume the old trees. All undergrowth and seedlings are swept away, however, and not infrequently fires thus started destroy valuable bodies of timber. This is especially true, also, in the coniferous forests of the Pacific region. The railroads of the country, using in the construction and maintenance of their permanent ways vast quantities of timber, inflict far greater injury upon the forests than is represented by the consumption of material. Railway ties, except in California, are almost invariably cut from vigorous young trees from 10 to 12 inches in diameter; that is, from trees which twenty or thirty years ago escaped destruction by fire or browsing animals, and which, if allowed to grow, would at the end of fifty or one hundred years longer afford immense quantities of valuable timber. The railroads of the United States, old and new, consume every year not far from 60,000,000 ties; the quantity of lumber in 60,000,000 ties is comparatively not very great, and would hardly be missed from our forests; but the destruction of 30,000,000 vigorous young trees, supposing that an average of two ties is cut from each tree, is a serious drain upon the forest wealth of the country and should cause grave apprehensions for the future, especially in view of the fact that in every part of the country there are now growing fewer seedling trees of species valuable for railway ties than when the trees now cut for this purpose first started. The condition of the forests of Maine is interesting. They show that forest preservation is perfectly practicable, in the Atlantic region at least, when the importance of the forest to the community is paramount. The prosperity of this state, born of the broad forests of pine and spruce which once covered it almost uninterruptedly, was threatened by the prospective exhaustion of these forests, in danger of extermination by fire and the ill-regulated operations of the lumbermen. The very existence of the state depended upon the maintenance of the forest. The great forests of pine could not be restored, but the preservation of the few remnants of these forests was not impossible. Fires do not consume forests upon which a whole community is dependent for support, and methods for securing the continuance of such forests are soon found and readily put into execution. The forests of Maine, once considered practically exhausted, still yield largely and continuously, and the public sentiment which has made possible their protection is the one hopeful symptom in the whole country that a change of feeling in regard to forest property is gradually taking place. The experience of Maine shows that where climatic conditions are favorable to forest growth the remnants of the original forest can be preserved and new forests created as soon as the entire community finds forest preservation really essential to its material prosperity. The production of lumber is not, however, the only function of forests; and the future extent and condition of those of the United States cannot, in every case, be safely regulated by the general law which governs the volume of other crops by the demand for them. Forests perform other and more important duties in protecting the surface of the ground and in regulating and maintaining the flow of rivers. In mountainous regions they are essential to prevent destructive torrents, and mountains cannot be stripped of their forest covering without entailing serious dangers upon the whole community. Such mountain forests exist in the United States. In northern Vermont and New Hampshire they guard the upper waters of the Connecticut and the Merrimac; in New York they insure the constant flow of the Hudson. Such forests still cover the upper slopes of the Alleghany mountains and diminish the danger of destructive floods in the valleys of the Susquehanna and the Ohio. Forests still cover the upper water-sheds of the Missouri and the Columbia, the Platte and the Rio Grande, and preserve the California valleys from burial under the débris of the sierras. The great mountain forests of the country still exist, often almost in their original condition. Their inaccessibility has preserved them; it cannot preserve them, however, much longer. Inroads have already been made into these forests; the ax, fire, and the destructive agency of browsing animals are now everywhere invading them. 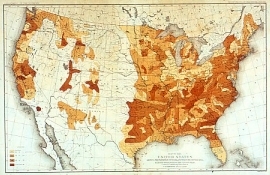 Their destruction does not mean a loss of material alone, which sooner or later can be replaced from other parts of the country; it means the ruin of great rivers for navigation and irrigation, the destruction of cities located along their banks, and the spoliation of broad areas of the richest agricultural land. These mountain forests once destroyed can only be renewed slowly and at enormous cost, and the dangers, actual and prospective, which threaten them now offer the only real cause for general alarm to be found in the present condition of the forests of the United States. Other forests may be swept away and the country will experience nothing more serious than a loss of material, which can be produced again if the price of lumber warrants the cultivation of trees as a commercial enterprise; but if the forests which control the flow of the great rivers of the country perish, the whole community will suffer widespread calamity which no precautions taken after the mischief has been done can avert or future expenditure prevent.